Among my first real experiences of King Arthur was as a teenager literally falling off a cinema seat in Grimsby. What were me and my friend laughing ourselves daft about? Why, Monty Python and the Holy Grail, of course. Naturally I knew more about King Arthur and his knights than soldiers with outrageous fake moustaches and French accents to match, or the noise of horses gleefully provided by coconuts and a black knight who refuses to give up even when he’s had all four limbs cut off. What I didn’t realise at the time was that, comedy aside, there was an awful lot of authenticity in the Python’s version of King Arthur and a great deal of of intellect behind it, Terry Jones himself being a medievalist. But there was something else about the film behind all that laughter, and that was perhaps the glimmer of a far more ancient and intriguing Arthur who I hadn’t yet had chance to hear or read about. It would be nice to say that the film inspired me to begin my Arthurian studies from then on and pursue them faithfully ever since. A few years later I read two books which changed my life and particularly my spiritual outlook. I bought them both, conveniently enough in Glastonbury, living in Somerset as I did at the time The first, Philip Carr-Gomm's wonderful book The Druid Way, got me into being a druid pagan for the best part of twenty years and the second – very different – was a book of stories of the sort I’d never encountered. 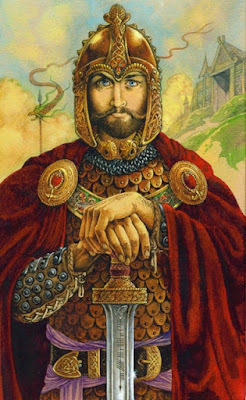 Here was a different Arthur, that really ancient one who I’d caught only glimpses of in the ancient Welsh stories of the Mabinogion. With him were ancient versions of many of the other characters I’d come to know and put away for all these years, characters with more ancient sounding Welsh and Irish names, fierce battles, mysterious world woods and enigmatic gods and goddesses. The book was The Song of Taliesin by John Matthews and I’m very pleased to say that John has agreed to be my interview for this blog and to talk extensively about his new children’s book about this 'older' version of Arthur, The Sword of Ice and Fire. I first met John by fax in 1998, when he responded enthusiastically to my request to adapt The Song of Taliesin for the stage. At our first meeting in Oxford, with my director Stuart, John and I briefly moved around each other like slightly wary stags, while John’s wife Caitlin made a delicious lemon cake and served it warm with hazelnut flavoured coffee. Out of such unwonted luxuries are true alliances and enduring friendships made. John and I collaborated on the original stage show of The Song of Taliesin and he later supported the recording of the double CD version in 2009. I’ve had many talks with John about the books that he truly wants to write and the almost impossibility of him being able to do any of it in this life time with a word load which is constantly being filled up just when that so tempting corner of space has appeared. I know, and I’m sure John will tell you here, that he, with the vast knowledge he has of the stories and myths of these lands and especially ‘a particular’ Arthur who has perhaps rather been forgotten, has a mountain of material and ideas ready to spin into literary gold. So that’s where I’d like to start, but first of all John, I really appreciate you agreeing to talk to readers of An Awfully Big Blog Adventure about your new children’s book, The Sword of Ice and Fire, and your own history and interest in this kind of material. And I have to say before we begin the interview, that I've just finished the book, which I asked for for my birthday, and I thoroughly enjoyed reading it and the ideas and characters you are 're-introducing' to people in particular, and as we'll find, they may not be the ones everyone expects. So the first thing I want to do, John, is to follow up on that ‘rather been forgotten’ comment. I know you and I and a great many others share a passionate enthusiasm for the sort of material you wrote about in books like The Song of Taliesin and The Song of Arthur and you are now hoping will reach new audiences with The Sword of Ice and Fire, but we’re still quite a small percentage, aren’t we, in even knowing about the version of Arthur you’re writing about in this book? I mean why do you think that is, and do you perhaps think it’s time for a reappraisal or revival of this material? I don’t really think that appreciation for the Arthurian legends has ever really gone away. I think if you stopped many people in the street and asked them what they knew about Arthur you might be surprised at how much. It may just be the obvious things, like the Sword in the Stone, the quest for the Grail, the love story of Lancelot and Guinevere and the magic of Merlin, but the idea of Arthur never really stopped being a matter of interest. There have been innumerable films and TV shows about Arthur, and I have no doubt that there will be more to come. Some will be really terrible, others will be not so bad, and maybe eventually there will be a really good one -perhaps as good as John Boorman’s great epic Excalibur, which inspired me enormously. The amount of fiction, short stories, poetry, plays, and an even more vast collection of books which set out to identify a real person called Arthur, seems to get more every year. I belong to the International Arthurian Society, which has members all over the world and produces a list of new publications every year – publications numbering in the hundreds. So Arthur is hardly forgotten. But I do indeed feel that it is time for a new look at the great myths behind the stories, so I’m setting out to produce something that you might think as a modern version of the Morte D’Arthur, the great medieval romance which is still probably the best book on the subject anyone’s written. The most obvious question to ask you is how did this enthusiasm of yours for the Matter of Britain and King Arthur begin? How did you become so passionately dedicated to this over such a number of years and make it your life’s work. I seem to have been interested by Arthur as long as I can remember. I know I had a children’s version of Malory when I was very young, but it was the discovery of T.H. White’s wonderful quartet The Once and Future King, which became the basis for the musical Camelot, that really got me started as a teenager. I knew when I’d read that book that this was the subject I wanted to write about, and I really haven’t stopped since. Most of my life I’ve explored the legends and the background to the myths in non-fiction terms, but I’ve always wanted to write a “big” Arthurian novel and that’s what I’ve been working on for the last 40 years. Unfortunately, time and having to make a living have meant that I had to put this on the back burner over the years, but I’ve never stopped tinkering with it, adding ideas and scenes, and hundreds of pages of notes exist. I’m hoping that after I finish the quartet of Red Dragon Rising I’ll be on to move on to finish the big book. Now, children or adults who pick up the book with certain expectations about the figure of Arthur are in for a surprise, as well as a treat. Can you tell us - without too many spoilers of course - what sort of things to expect, perhaps especially a few of the characters we might meet who we haven’t encountered in other Arthur stories. I’ve tried to stick with the tradition of Arthur as far as I can – but I really wanted to extend it, to open it out, to show readers just how big it really can be. 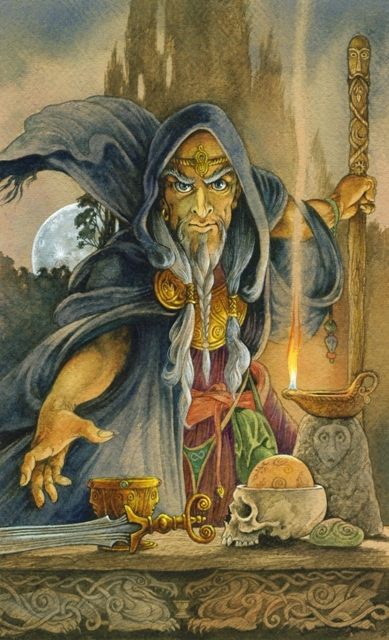 There’s certainly no shortage of Arthurian legends to draw upon, but I went further into the realm of Celtic mythology, particularly the Mabinogion, that wonderful Welsh Medieval collection of tales - so you will find, for instance, in this first book, the character of Mabon, a kind of young God, who gets kidnapped and has to be rescued by Arthur, helped by some rather unusual beings, who are part animal, part bird, part human. Then there are the Nine. These are nine mysterious, otherworldly women who will in due course be shown to have a huge part to play in the whole story of Arthur’s life. So there will be one or two surprises, and some characters that people won’t know about or won’t be so familiar with. Do you have any particular favourite authors who provided inspiration for these books and why? Maybe there are others you don’t so much care for? I have a lot of Arthurian writers whom I love – all the way from Malory in the 15th century to present authors such as T. H. White, Kevin Crossley-Holland, A. A. Attanasio, Henry Treece, and especially the great Rosemary Sutcliff, whom I had the pleasure of getting to know years ago, and whose books remain great influences on me. Her adult novel, Sword at Sunset, is still, I think, the best novel of Arthur that anyone’s written to date; while her children’s books, retelling the story, gives a wonderful inclusiveness to the epic of Arthur. Much as I love T.H. White, who wrote the only other novel I’m aware of that deals with the childhood of Arthur, The Sword in the Stone, I found the humour with which this is written somewhat dated and perhaps occasionally seeming to trivialise the story. I wanted to tell how Merlin prepared Arthur to be the king he would become – and that’s what I set out to do in these four books. I’m keen to ask you about the other three books, each of which involve the particular quest Arthur has to undergo for each particular hallow? Can you explain what a ‘Hallow’ is and how they weave through the books? Sword of ice and Fire is conceived of as one of a set of four, the overall title being Red Dragon Rising. These will follow the early years of Arthur from around the age of 10 to that of young adult. Each of the four books will focus on Arthur’s quest for four magical objects. These are called Hallows, which simply means ‘sacred things’. It’s a theme that runs through all of the huge panoply of Arthurian legend and literature. The most obvious and familiar of these would be the Grail, though in this instance I’m looking more towards the ancient Celtic and pre-Celtic traditions, where the standard idea of a cup or chalice is replaced by that of a great cauldron. In the first book I knew right from the beginning that the object of Arthur’s interest in this instance had to be the Sword–because what is Arthur without a magical sword! However I didn’t just want to go for the familiar Sword in the Stone story, which has been pretty much covered by everybody from Thomas Malory to Kevin Crossley-Holland – instead I went back to the idea of a magical weapon that would combine elements of fire and ice – the fire of the earth, the ice of deep space, combined to create an object that is deeply tied into the history of the land itself. So that’s what Arthur is looking for in this first volume. In the next volume he’ll be looking for the Cauldron of Light and Shadow, and this will take him to some rather unusual places. What characters can we look forward to seeing in future books? I’m wondering if there might be a role for a certain Primary Chief Bard? You’ll find quite a few familiar characters in the first book: Merlin of course; Kay, Arthur’s adoptive brother; his foster father Sir Hector, and so on. 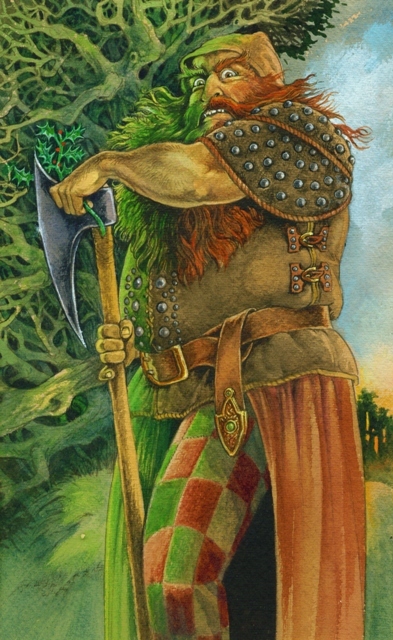 There’s also an important role for a figure known as the Green Knight, though here he appears in a rather different guise to that with which most readers would be familiar from the medieval poem. What I tried to do was draw upon the whole spectrum of the Arthurian legends, which I studied for many years, and to put them into context of an entire world, here called Albion, which is the mythical name for Britain, and to use as many of the characters from those original legends as possible. This means I can put in less familiar figures such as the Nine otherworldly women who ruled over the mystical realm of Avalon, where we find Arthur at the beginning of the book, living in a rather strange castle where positively anything can happen – and does. I intend to put as many of the characters, both known and unknown, into the books, as I can and you’ll be pleased to know that there is indeed a role for a Primary Chief Bard in Book Two. John, this book isn’t your first venture into writing for children and over the years you’ve written a fair few. Would you care to talk about some of those – I know for example that the predecessor of the young Arthur series was one about a boy adventurer called Henry Hunter. Can you tell us about him? I’ve written several children’s books in the past, including collections of folk and faerie tales, and two previous novels aimed at middle range readers and younger, featuring a character called Henry Hunter, who uses old-fashioned detective skills, reads books rather than using the Internet, and has adventures which take him into the realm of the supernatural. The first of these, Henry Hunter and the Beast of Snagov, is a take on the Dracula myth, and the second, Henry Hunter and the Accursed Pirates, features some undead pirates and a rather famous villain known as Blackbeard. I enjoyed writing these immensely and have several more planned, but Red Dragon Rising comes first. Finally John, you obviously think its important for us to have these stories of King Arthur out there. What do you hope children in particular will gain by reading The Sword of Ice and Fire and the rest of the series? I’m writing these books not just for children, but for any age group interested in myth, and the one thing I wanted them to come away with was a deeper understanding of these ancient tales which underlie so much of the culture of this country. Just about everyone has heard of King Arthur, and most people could tell you a couple of the stories - but there is so much more to them. There’s a whole world of Arthurian mystery, magic and drama, and eventually I want to cover the whole story. In fact the Red Dragon Rising sequence is really only the beginning of a much larger project. I’ve been working on a huge Arthurian novel called Broceliande (that’s the name of the Arthurian forest that features in many of the stories, as well as being a real place in Brittany) which will follow the life of Arthur from the moment when he becomes king to his vanishing into the underworld. Bits of this went into my two collections of stories, The Song of Taliesin and The Song of Arthur, the former of which became the subject of a dramatised version adapted by you - and which I love. I think anyone who becomes familiar with the stories will learn about honour, truth, the search for a better way of life, the desire to make a better world. I know these seem like huge ideas to put into a story like this, but the Arthurian legends are huge, their scope is almost beyond anything we can imagine today - as big as Tolkien’s Middle Earth, the universe of Star Wars, and the mirror world of J.K. Rowling – all of which borrowed heavily from these older tales. I am very happy that Greystones Press, a small but brilliant local publisher, took these on. I look forward to completing the other three - book 2 is already on the way. Well I'm sure I speak for all readers of this blog, when I wish you all the best with the rest of the series and hope that you finally get the chance to complete that epic of yours. Thanks, John, for talking to abba. Thanks, Steve and I shall certainly do my best. Plus if you liked the images from The Camelot Oracle by John and Will Worthington, there are also copies. All the above available from Hallowquest.org.uk, Amazon.co.uk & Amazon.Com . Steve Gladwin is a writer and screenwriter, author of The Seven and The Raven's Call and co-writer and story editor of the Fragon series. I’m very excited about this! I am a huge fan of John Matthews’ non-fiction. I didn’t know about the fiction, let alone the children’s books. Thanks for arranging this, Steve! Thanks Sue, and you're welcome. I'm glad to have pointed you in a new direction.